Another week in the books, and Edge of Extinction had its best episode yet. As I noted last week, the end result was kind of foretold by the lack of screen time afforded to Eric; but during the episode itself, it never felt like a sure thing. A bonus: we finally got given decent screen time for Julia, Gavin and Aurora, leaving us with no truly invisible players left in the main game (although those three still remain underexposed). There was so much good and terrible play that, this week, my four points are all simply breaking down who played well, and who didn’t play so well, to bring together this week’s vote (and, in one case, someone who had no role in the vote at all). The narrative amongst the community last week seemed to be "how can Lesu possible regroup after that?" They were well played by Kama, as every member of Lesu voted for another. But at the start of this episode, Kelley and David showed themselves to be the veterans they are when they immediately regrouped and formed the first plan of the episode; get Aurora and Rick onside, have Rick, David and Aurora form part of a split vote plan with Kama, and then defeat the plan with six votes to Eric. It certainly would have worked, but was scuppered when Rick was not willing to entertain the idea. David also handled Rick as well as he could have. Although they parted ways on this vote, David refused to give his half of the idol to Rick, forcing them to remain in communication. At this point, either could sink the other’s game, and to some extent David is playing a dangerous game. But there will come a time when David once again wants to target Kelley — and if he’s kept a good relationship open with Rick, there’s every chance they can get back on the same page at that point. The question is whether Rick will be willing. David’s attempt to paint himself as a "passenger" in the game, while it can be perceived as accurate, was also a very cunning move. David is all too aware he is approaching the point at which, in Millennials vs. Gen X, he started being a target each and every week. If he can continue to paint people such as Kelley, Wardog and Ron as more immediate threats, he might find himself in a position to make a real run in the endgame. Aubry was the one person with the presence of mind to correctly interpret her clue to an advantage on Edge of Extinction. The advantage itself seems largely pointless (what are they going to do, reset the course for her each day? Set it to be the exact order she’ll find in the challenge itself? It’s hard to know exactly how practice will help her... ), but it’s still better for her to have it than someone else. She also sent her extra vote to Aurora; although Aurora was her in game ally, it seemed like a somewhat surprising choice when David was also in the game. But it’s the perfect place for an extra vote to be in the game’s current climate, and it leaves Aurora feeling empowered to make a move when she needs to. What’s more, Aubry continues to get the bulk of the air time over on extinction. Joe gets to spend a little time alone (and show off some skills with a bottle), but didn’t start ‘catching fish for everyone’ or demonstrating any social game there at all. Reem gets the obligatory good sound bite. 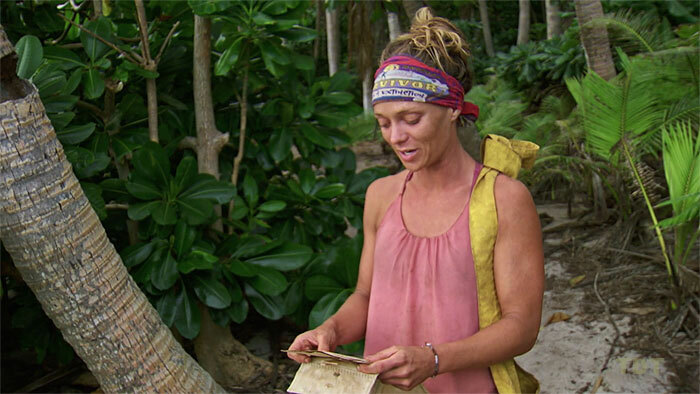 But Aubry is holding the narrative on the island right now; it could simply be that she’s easily the best narrator, but I’m certainly not going to bet against her return at the moment. Wardog was easily the player of the episode, and has put together quite some résumé. Wardog tried to bring in Rick quite calmly (and reacted as well as could be expected in the face of Rick’s reaction), then accurately recognized the Kama dynamics, and started pointing them out to Julia and Gavin. Wardog has consistently demonstrated that he understands how to express how what is in his best interests is also in the best interests of the person he’s talking to. It’s a skill; one that many players have, and he’s good at it — probably because he chooses to point out truths. Wardog stands in stark contrast to a player like Angelina, who often proposed ideas that were in her allies' interests as much as her own, but whose ideas played as transparently selfish. It’s an interesting contrast, because I think the two players are somewhat similar — rational, strategic, and with a tendency to annoy their allies. Even though Wardog is better at convincing people that his ideas are in their interests, I’m still worried that in the end, people are going to be irritated enough at Wardog that they won’t vote for him. Better that he gets voted out than ends his game as a 0 vote finalist — it wouldn’t be deserved. Another thing about Wardog’s conversations with Julia and Gavin. I don’t truly believe Wardog thought they would work (or, at least, not so immediately). They played to me like he hoped he could escape the vote for at least this day, make sure that the votes were heading towards Kelley or Lauren rather than him, and then regroup with Julia and Gavin when they were ready. The votes might have been heading towards Kelley and Lauren anyway, but the split excluded Wardog. The best thing that could happen for Wardog about now is probably that Kelley gets voted out. I’m a big fan of terrible play on Survivor. It often creates the inertia that gets the strategic endgame, and here it was no different. Let’s start with Rick. In a hilarious rejection, Rick made it abundantly clear that he would not work with Wardog, Kelley and Lauren again. While it was great TV — it was a terrible move from Rick. Firstly, he was sitting in the South Pacific Cochran spot; and while it was unlikely he did quite as badly as 7th in that alliance (although well possible), even if he had been used by Ron and Eric to get the upper hand, it’s unlikely his finish could have been better than 5th or 6th without an immunity run at the end. So Rick needed to be open to all options. But even if Rick had good reason to trust he might make it to final four with Ron, his choice to make his allegiances so overt to Wardog likely created what followed. Rick could have been double agent and rumbled Lesu’s plan if he didn’t so overtly reject the offer, making sure Eric’s group didn’t split the votes. But even more than that, it would have meant Wardog had no need to try a different path, and Wardog might never have approached Julia and Gavin at all. The result was that by rejecting the group he perceived as the minority, he ended up creating a minority of his own. Eric and Ron didn’t do much better. It’s long been said the players out on the island use the family visit as a sort of ‘checkpoint’ they want to reach. Used sparingly, it might even be good incentive, especially in small alliances. But say it too often, make it a mantra, and you make it transparently obvious that you believe that achieving it leaves you in a really good spot in the game. Eric followed that up by not recognizing Julia’s suggestion to vote against David for what it was — a trap. In doing so, he laid bare his endgame — his plan for the entire game laid out. Eric was caught thinking of the rest of the players as pawns in his game. Even Julie isn’t fully exempt. 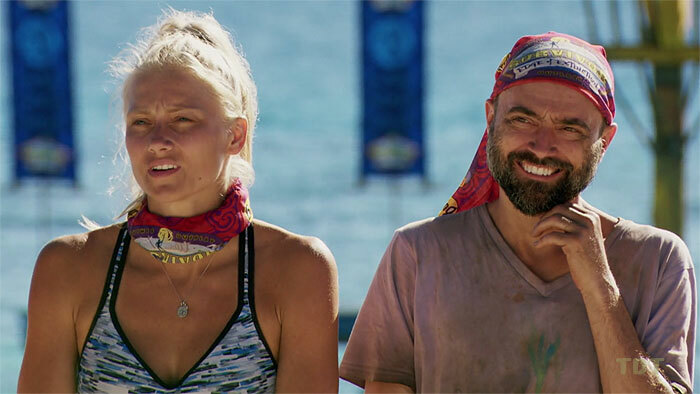 At the immunity challenge, Aurora was looking to get a bit of assurance from her Kama tribe that she was fully on their side, by getting Victoria to step down. Aurora was using a moment where she had leverage to find out where she truly stood in the Kama tribe. It was the right instinct, a perfect occasion to discover her spot in the game, and the answer wasn’t flattering. Julie called her out for negotiating while Lauren was passed out, and while Julie may have been genuinely upset, it betrayed the fact that she wasn’t worried about Aurora’s fate in the game. Eric didn’t help the situation either; in another of his mistakes, he cheered Victoria on against Aurora. In this moment, Victoria didn’t play that well either, although I’ll separate it from her bigger move later. Victoria should have just stood down and handed Aurora the challenge. For the most part, you shouldn’t give up immunity when you have a good chance of winning it; but on occasion, it’s the difference between maintaining your majority and risking it. The sum of Eric, Julie and Victoria’s decisions at the immunity challenge surely left Aurora ready to flip the moment she felt she had the numbers to, when the first priority for this phase should have been to make sure they kept Aurora on side. Bad play all around. Aurora finally got air time in this episode, but it didn’t really leave us any the wiser about how she ended up voting the way she did in the vote. She said she’d go with the numbers, and perhaps it was as simple as her learning which way the numbers were going. But it feels as though keeping he Eric vote a secret meant we missed out on a lot of Aurora’s thought process. It’s a shame, because I think knowing exactly where Aurora stands is the key to assessing this episode’s biggest move. Lauren didn’t play badly, but she didn’t have the noticeable impact that the rest of her alliance did. In addition to that, she’s had a story about not eating and being weak that’s been building up to this faint for several episodes. I’m quite worried for Lauren that her weakness is going to stop her being a meaningful part of the game; she could become a medevac, or a pawn, or a mercy boot. If she’s going to be a substantial character to win, her story needs to turn around and soon. Do we have enough information to work out what that reason might have been? No. But I do think we can evaluate aspects of the move, nevertheless. The basis for my evaluation of the move assumes that the three made a correct assessment in assuming a move would be made against them at 8 or 9, leaving the three of them to finish between the range of 5 to 9 (allowing for David going as soon as possible and Rick making it to final four). The fate of all finishing between 5 and 8 is the fate that I must accept they had to make a move – at some point – to avoid. How much time did they have to make a move? If we are to presume that the Kama 6, Rick and David roll all the way to final 8, it seems likely that David and Rick choose to side with Eric/Ron at that vote (at least) and remove one of the trio in a 5-3 vote. If Rick stays strong and refuses to swing, that leaves no remaining path for the other two. So from young Kama’s perspective, it’s clear they’ve lost the advantage from the moment it makes more sense for David to vote with that four. That moment probably comes at final 10, when Aurora could be brought on board for a 6-4 vote to avoid going to rocks. That means that, absent any knowledge of advantages, young Kama only realistically had two votes, at 12 and 11, to make the move. They knew they had the votes at 12. Could they have guaranteed the votes of David and Aurora at 11? It’s hard to be sure, but in the absence of knowing that, I can see how pulling the trigger at 12 might make sense. The move was definitely suboptimal, but not by much, and it may have felt like taking a risk just wouldn’t be worth it. What impact does making an early move have for the people on the bottom of a majority alliance? 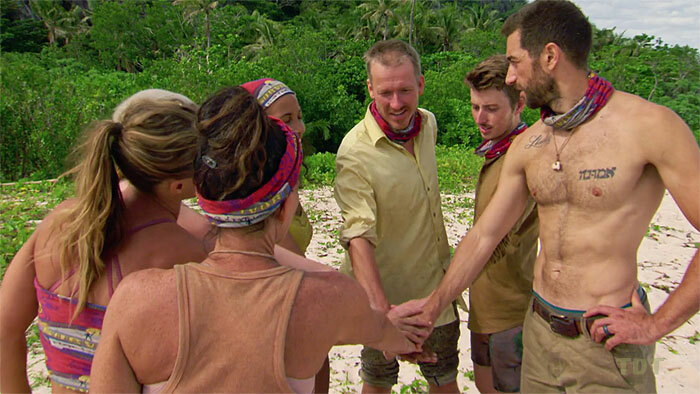 When moves like this get made at final 12, players aren’t only thinking about their resumés, they are also thinking about seasons like Redemption Island, South Pacific and One World — three seasons on the trot where the bottom of the majority never made a move, which at the time felt a little like the slow death of Survivor. The following seasons helped reinvent Survivor because people became more willing to make a risky move to get themselves off the bottom. But there are also more recent seasons where people in a majority have either pulled off or considered a big move against someone in their majority. In Cambodia, an alliance made up primarily of ex-Bayon players had an 8-3 majority over the "witches coven," an alliance that included Kelley Wentworth. At final 11, Stephen Fishbach was concerned that the alliance was coalescing around a core group of Joe and Kelly Wiglesworth, and gathered Jeremy and Spencer to make a move against that group (with the help of the coven). If (like with this week’s episode) you accept at face value that those three players would have been the bottom of the group of 8, their positions went from being 6th, 7th and 8th to being 1st, 2nd and 10th. Fishbach paid an immediate price for the move, going earlier than he would have otherwise — perhaps even substantially earlier, since Jeremy might have been the more immediate threat. But Jeremy and Spencer parlayed the move into making it to the final three. In Millennials vs. Gen X, Adam Klein was faced at the first swap with the possibility of taking out Jessica Lewis or Ken — instead he chose to take out a Millennial, Figgy, because at that time, she was part of a 5-4 Millennial advantage over Adam. The millennials could easily have gone into the merge at 9-4 up, and dominated as a tribe. 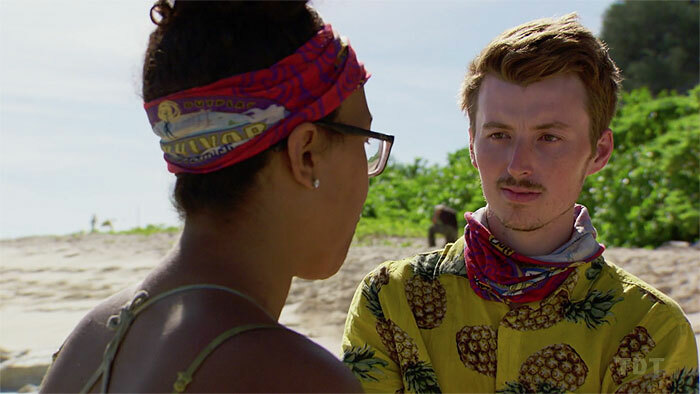 Ultimately, Adam’s choice set a tone that saw Michaela eliminated as well and prevented the millennials working together at the merge — where Adam and his allies Hannah and Zeke voted against Michelle — one of the remaining four from Figgy’s alliance, and prevented the larger Millennial group from gaining control. Even though these decisions gave some immediate power back to Gen X, the impact for Adam, Hannah and Zeke was that they ended up 1st, 2nd and 10th, instead of potentially all coming in the 5th to 9th range. More recently, in David vs. Goliath, we saw a mythical alliance dubbed the "strike force" fail to eventuate. Alec and Alison, from a larger Goliath majority, seemed to give genuine consideration to making a move against other members of the Goliath tribe; ultimately, however, they continued to stick firm with the Goliath alliance. It’s impossible to know what would have been for Alec and Alison if they had decided to make a move sooner — but if they are clearly and actively working with the strike force, there’s a much higher probability that they survive longer simply by being swing votes that are needed by all sides. What is clear is that without the move, Alec came 10th and Alison 5th — surviving that long only because the David tribe started making moves against itself, despite her name being on the block every vote from final 9. The thing all three of these seasons had in common is a 13-person merge in which a large majority exists or is possible, and one tribe could make a straight run to the end; just like the current season. The pattern exists from the earliest days of Survivor (Sean Kenniff, or Jerri & Amber), but the possibility of splitting a dominant tribe in two leaves larger groups, and has to happen much earlier, with such early merges. OK, you got me, this one isn’t recent. And I already spent plenty of effort speaking about it last week. But it was the original situation, and Neleh, Kathy and Paschal improved their lot from 5th - 7th to come 2nd, 3rd and 4th. In Samoa, a majority of 8 was wiped out by a smaller group of 4, but it never happened in this way. First, the whole group voted out one of their own (no fracturing), and then Russell Hantz was enabled to do enough to eliminate them one by one from there, through idols and playing Shambo off against the group. They didn’t lose thanks to some kind of grand break-up — in fact, it’s possible they would have been better off if that had been the way it dissolved, as it might have enabled Foa Foa to also play a more flexible game, rather than being forced to hang together. As for Phillipines, the Tandang fall apart is to some extent another example of the minority (Michael and Lisa) overcoming the majority, albeit they hit the merge at 3-3 with Malcolm in the middle. Tandang hit the final 5 with three players, and two from Matsing, having eliminated the Kalabaw tribe entirely. Michael and Lisa might have been expected to come out last in the Tandang group if they had stayed Tandang strong until the end; instead they came 2nd and 3rd. My point is that, in thinking it through, I think I’m willing to label the move made by Julia, Gavin and Victoria as probably a net positive for them as a group — but it’s also quite possible that by destabilizing the status quo, at least one of them goes much earlier than expected — perhaps even as early as this week. Are you better off going out 11th creating a move that might propel one of your allies to the win? It certainly beats never making a move at all, because history suggests that at least one of you is making final tribal council, and it might just be you. Of course — this presumes they really were on the bottom. And that they had the right read on the room and needed to make the move now. But if we give them (and the show's editing) the benefit of the doubt on that front, in the end I think the move checks out. Someone is going to benefit. For now, I still think that someone is Victoria. As always, thanks so much for reading, I appreciate it. Please comment and tweet at me, I love to hear your thoughts. With any luck, we’ll see you again next week!